I'll invite all our contributors to here. Some sort of spotlight on Worldbuilding: monthly, specific questions or non-challenge tags, Monica. @James, @bilbo_pingouin, @knave, @Liath, @Samuel, and those already here. This is the blog chatroom, where we can organise blog-type stuff and not saturate the main room. @knave mentioned a possible series on conlangs here. topic will mainly cover the world building process at a high level with follow on articles covering specific topics. Curators: you've got edit rights, use 'em! If you want to change something about the publication, just go ahead (within reason, preferably no name changes without some discussion). We can have featured stories, which I've currently set up with the intro post featured - you can change these, and please do. I have a line in mind that makes me laugh, "If you believe that a deity created our world, do you suppose that after a while he just started phoning certain locations in after things got repetitive?" I've got a post in mind about the math behind generating fractal terrain. If anybody would be interested in writing something about applying that to software, that would be cool. @ArtOfCode Do you know if we can create tags on Medium? I haven't had much chance to play with the admin functions. @ArtOfCode I was thinking of a basic tutorial on it, although I'm not quite sure what format that would take. @All: does it make sense to have a weekly blog planning meeting, where we discuss our possible aims for the week and form some sort of publishing schedule plan? @James I haven't been able to, when I tried. Most are already there, though. @ArtOfCode I vote yes for that. @HDE226868 Definitely a good idea. IN fact, while we all seem to be reasonably well around, how about the first one now? Thursdays, 1600 UTC work for most people? Or what other times would suit better? @ArtOfCode Not good for me. School starts next week, and 1600 falls right in the middle of the day (just after lunch). I can re-read the transcript later, though, and ping with any comments. @ArtOfCode I am not sure setting a time will work the best just with our international-ness. Maybe just use this chat room and say we will discuss topics on Thursdays? I dunno that has its drawbacks too...hmmm. @HDE226868 Ack, timezones. I'm back at school already, and 1600 UTC is about right for me. @James That's actually a good idea. If we say Thursdays people drop in here, drop their ideas in for the week, and people can comment whenever, that works. @ArtOfCode Ah, right, you're in the UK. @HDE226868 Reference. Approve of it. @ArtOfCode agreed. Thursday is blog-planning day; come by when you can. @MonicaCellio You get the reference? Just checking. ArtOfCode has added an event to this room's schedule. There we are. Event added: blog planning day, every thursday for "1440 minutes"
Ok all, what articles do you expect to be able to write between now and next Thursday? Topic: World Building Process Intro. I should be able to get the next planet thing written this weekend. I expect to get another one maybe two written this week, though I don't know what topics. I'm away Friday-Saturday, so I may or may not be on the site, and I probably won't be able to get at the blog. Ill be out of town this weekend too but maybe that means I will have time to do things since I won't be working around the house and whatnot...we shall see. I'm thinking about writing something arising from the question about people with fur, because I think the answers there really bring out that what you think is just a cosmetic change to make your people "exotic" has wide-reaching effects. I want to riff on that. @MonicaCellio Is that likely for this week? +1 to the count. 4 definites. Of those four, one is written already (Art's). So we can use that to tide us over a lull if we're facing one. James and HDE are aiming for this weekend. So am I. And Monday is a civil holiday in the US, so that helps. I certainly am right now. @ArtOfCode Does Medium support LaTeX? @James A bit long for a tag wiki, but great nonetheless. @HDE226868 lol, yes, yes it is. @HDE226868 long for a typical tag wiki, but long, comprehensive wikis are a good thing. There's one on SO (I forget which tag) that's an excellent introduction to its programming language, for instance. @ArtOfCode and others, just fyi, I've been out for the last week due to moving in to my new house (with my new wife!). I'll be out the next week due to eye surgery (PRK). I've not abandoned the cause! I will return. @Samuel Geez where are your priorities! @Samuel congratulations on your wedding and new house! Good luck with the surgery. @bilbo_pingouin You in Europe by any chance? Your active times are pretty similar to mine. @bilbo_pingouin You live in Luxembourg? Damn, no I'm wrong. You live in Germany. Your first language is not German. It's French. @bilbo_pingouin Nope, the IP DNS lookup doesn't resolve to Lux. Oh, and your ISP. I think I understand the fractal-generating method now. @ArtOfCode that was to choose a populated and not so-rich country to a less populated rich country... luxembourg sounded like a reasonable extreme case. by the way any idea about that program thing? @bilbo_pingouin Yep. It's the matrices behind the fractional Brownian motion that take some time. @ArtOfCode sounds good. You might want to move some messages from here to there, too. the history of those chat isn't kept as long as the chat is being used? Suggestion for blog authors: when you're ready, create your post and then submit it to Universe Factory, even if you have editor privs and could publish it to the blog directly. We can decouple the writing and the publishing, to let us spread the publishing over time a bit. Sound good? It sounds like we have four definite articles for the coming week and we might get some others, so we're looking at one posting every day or two. @Zizouz212 cool! Are you signed up with Medium already? (If not, an OpenID login will fix that.) We can add you as an editor once you have an account. @MonicaCellio I can't actually find a way to do that, which may be a product of being the owner. Can you tell me what the workflow is for you? @ArtOfCode I had a "submit to publication" menu option or some such. Hmm, maybe as the creator you're different in that regard. So the workflow was: create story; publish (assign tags), which adds it to your own page; submit. I did that the first time; for the second one I just published directly. 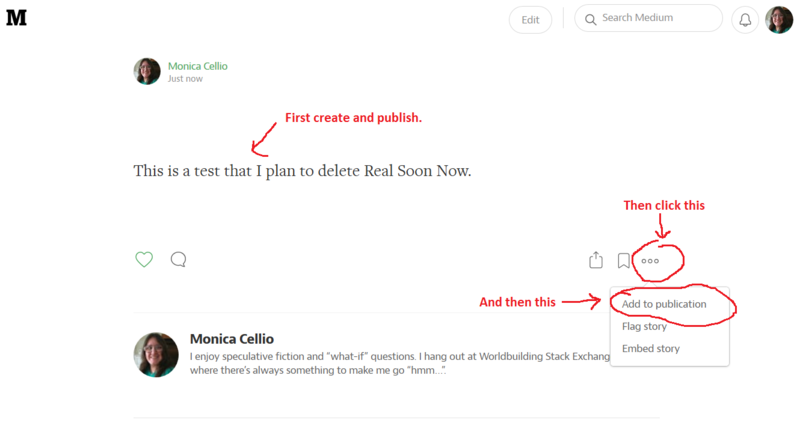 @MonicaCellio Yeah, I definitely didn't have that - I just had a publish in publication button, presumably in place of the submit button you had. Oh, hang on -- I just experimented and it's counter-intuitive (but I remember this now so it is what I did). Screen shot coming. @MonicaCellio Your paint skills are amazing! @MonicaCellio Hmm. That's what I did - but it just published. @ArtOfCode if you don't do that last step (should've numbered, sorry -- lowest one on the page), it publishes to your personal blog-space. People will see it if they click on your name. But it won't be in Universe Factory yet. Oh, @ArtOfCode, what happens if you choose "create story" from your own page, or somewhere else on Medium that's not the Universe Factory blog page? It seems odd that owning a publication would bar you from posting things elsewhere, after all. @MonicaCellio It doesn't. I can publish to my own blog space, or to other publications presumably. Oh wait, I see -- that "add to publication" link isn't submit; it's an add, and any editor can do it. Hmm, how did I submit the first post for somebody else to approve? Um, no idea. Ok, first person who (re-)figures out how to submit a post instead of directly publishing, please share! @MonicaCellio Yay! We r smrt peoepl. ...I apologize if I make no sense today, I am really really tired. I've got that everything is funny cause I need a nap desperately thing going on.